Just how many people can afford to follow annual kitchen trends is debatable - especially with such uncertainty over Brexit. But one thing is clear and that is that mix and match is on the up giving personal tastes and favourite pieces the thumbs up. Easy is predicting that 2019 will be the year of real sustainability and that everyone needs a realistic approach to their decor. They say we should think louder colours, mixing palettes and combining styles. That is all certainly an invitation for the lovers of vintage to be more experimental or to incorporate a greater mix of styles and periods. 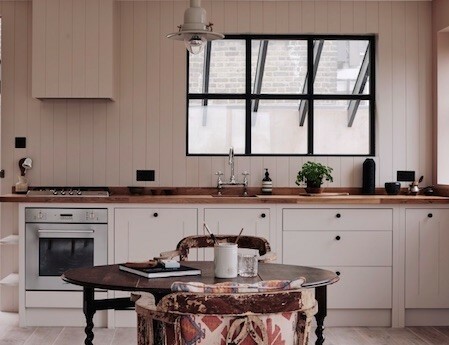 Let’s face it, we are probably already past masters at that, although going one better is the predicted combination of rustic and modern with polished worktops and traditional. But if there’s a time which is being given greater emphasis then it’s the continuing trend for mid century modern and in particular the seventies. An opportunity to return to earthy tones and terrazzo surfaces that have fallen out of favour. And safe in the knowledge that our readers are unlikely to have sleek glossy white kitchens we have no problem in saying that they are out, out ! The uncertainty of year really means that unless you are the recipient of a seriously big end of year bonus, then some simple ideas to give your kitchen a make over is really what’s needed. So our focus here is on cosmetic rather than structural changes. Kitchen trends for 2019 make for interesting reading: Metallics are set to continue with more brass taps, and copper pans hanging on walls or racks. If you have money to spare then copper sinks are a must have. Fortunately the Industrial look continues with wood, metals and stone still making great combinations. And nothing reinforces that more than an array of soft metallics like our vintage aluminium pans and colanders. It’s a year of contrasts with some strongly hinting at earthy tones of mustards, chocolate, caramel and olive green. 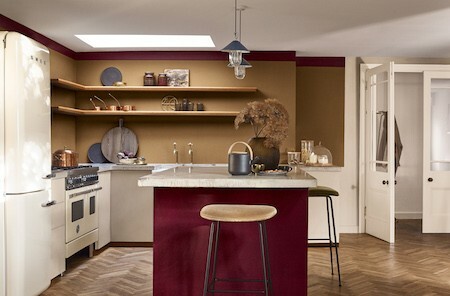 Reinforcing that is Dulux’s colour of the year which is Spiced Honey. 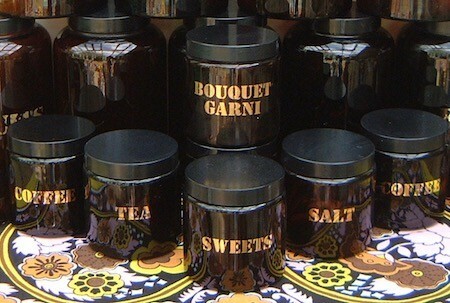 Pictured here, it would look great accessorised with Biba’s brown glass and gold jars and an array of copper pans. 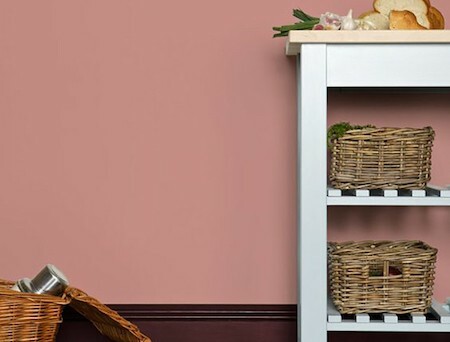 Others are predicting more pinks with Farrow & Ball’s Blush Pink continuing (top). But, if like me, it’s a pink too far then their Setting Plaster with a touch of yellow pigment is far more subtle and can blend well with existing old dark polished wood like this Chan & Eayrs kitchen in New Cross Lofts. Over-detailed carpentry seems to be giving way to simpler lines, so changing cupboard doors is a way forward with companies who specialise in doing just that. 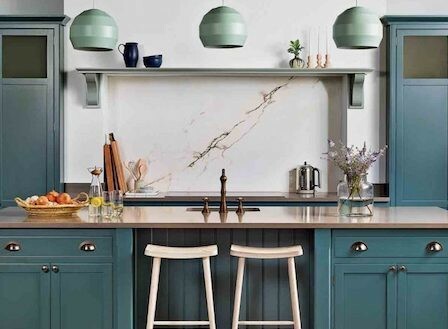 Some kitchen companies are predicting that this year will see the rise of two-tone cabinets with forest green leading the way - perhaps doubled up with mustard. Others say that last year’s dark navy will still be with us for a little longer. 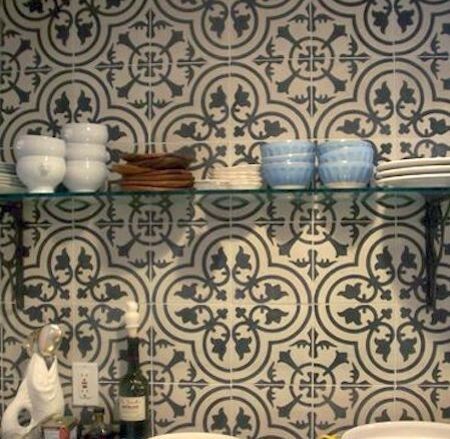 Another trend which won’t quite break the bank is the splash back feature wall. No longer will two rows of tiles suffice, it’s tiling right up to the ceiling. Design experts House reckon that it adds texture and visual interest. And with mid century a trend look, then these brown and white tiles will certainly do the job.